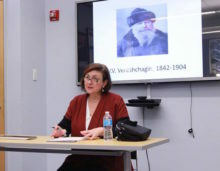 On February 10, 2017, the Jordan Center for the Advanced Study of Russia at NYU welcomed Dr. Ada Dialla for a lecture entitled, “An Artist on the Move: Vasilii Vasilievich Vereshchagin and Russian Humanitarianism in the Second Half of the Nineteenth Century.” Anne Lounsbery, the Department Chair of Russian and Slavic Studies at NYU, introduced Dialla, who is an Associate Professor of European History in the Department of Theory and History of Art at the School of Fine Arts in Athens, Greece. The event was part of the Occasional series, co-sponsored by the Jordan Center for the Advanced Study of Russia and the NYU Department of Art History. Dialla contextualized what “ethics of care” meant in the late 19th-century Russia. The concept, she said, was part of the “Russian self-image of being a ‘civilizing polity’” and “an integral part of the ‘civilized world’” comprised of Europe and America—at the time, human atrocities were considered to arise only in “barbarian environments.” While 19th-century humanitarianism was related to philanthropy or charity, it differed in the fact that it was “based on the concepts of rights and duties of men and women, of societies and communities” in order to improve and reform how people lived. The Geneva Conventions, a series of international treaties created between 1864 and 1949, also grounded the development of humanitarianism, as did the contemporaneous rise of pacifism, which created the concept of “civilized warfare,” advocating for the humane treatment of prisoners of war and the intervention of the Red Cross in conflict zones. “Artists contributed to the rise of this new sensitivity,” Dialla added. In Russia, there was “a public space of communication, […] a milieu in which words and concepts associated with war were transmitted and became common knowledge,” she said. New technology such as photography, the telephone, the telegraph and electricity transformed the nature of everyday experience, creating “a common space, an array of ‘visual tropes’” to represent non-Europeans, “which reproduced the stereotypes and perceptions regarding ‘civilization’ and ‘barbarity,’ order and disorder, victims and offenders, the powerful and the powerless, the saviors and the helpless,” Dialla said. Russia itself was a country in a cultural renaissance, as art exhibitions, journals, galleries and education flourished. These events helped put ordinary people in contact with war and conquest in distant lands. Vereshchagin, whose life was “enmeshed in wars, conquests, liberation struggles, Empire, and new opportunities, […] which came with speedy communication and the increased speed of travel,” in many ways embodied the great events of the second half of the 19th century. Born in 1842 in Novgorod, he studied at a military school, later joining the Navy on voyages to Denmark, France, Britain and Egypt. In 1861, Vereshchagin left the Navy to study art at the St. Petersburg Imperial Academy of Arts, and later under Jean-Léon Gérôme in Paris. Six years later, his military and artistic experience converged. General Konstantin Kaufman, who invited Vereschagin on a military expedition to Turkestan, “wanted to have with him artists like Vereshchagin to be able to immortalize, with paintings and drawings, the deeds of the Russian army against the ‘unruly’ nomadic hordes of Central Asia.” Over the course of his lifetime, Vereshchagin traveled to British India, Tibet, Jerusalem and Cuba, introducing himself “not only as an artist, but also as a soldier and traveler.” He also volunteered in the Russian Imperial Army in the Russo-Ottoman War (1877 to 1878) and the Russo-Japanese War (1904 to 1905) where he died on a warship bound for Russia. Historians, Dialla said, generally agree that Vereshchagin’s main contribution to art was in his presentation of war. Whereas earlier artistic endeavors “glorified the greatness of one’s country and its military commanders” and limited portrayals of violence to the “odious conduct of ‘barbarians,’” Vereshchagin “showed the dark side of war,” as someone who had been an active participant himself. Dialla then brought up images of “The Barbarians,” a series of Vereshchagin’s paintings that featured in the 1874 Crystal Palace exhibition in St. Petersburg. While successful, one work in particular shocked viewers: “The Forgotten Soldier.” In the painting, Vereshchagin showed devastation, abandonment, and death, embodied in a slain Russian soldier surrounded by vultures. Instead of depicting heroic figures fighting and dying for glory in the face of barbarians, Vereshchagin painted “as if he were a reporter of reality, an eye witness of the victorious war in Central Asia,” Dialla said. Conservatives, the Imperial court, cabinet ministers and the military harshly criticized the series, arguing that “such things [did] not occur in [their] army,” and that the painter had warped the heroism of war—a danger to military morale. General Kaufman turned against Vereshchagin and Tsar Alexander II removed the painting from the exhibition. In response, “Vereshchagin reacted to the censorship by self-censorship, destroying the painting as well as two other with similar themes,” Dialla said. In the Q&A session that followed, audience members asked Dialla to expand on certain aspects of Vereshchagin’s work and legacy. Susan Smith-Peter, President of NESEEES, mentioned the work of the historian Peter Holquist, who sees Russia as significant in the development of an international framework for anti-war or prisoner of war rules, and wondered if Vereshchagin has a place in the the larger framework of Russia’s international legal interests. Another question considered Vereshchagin’s commercial interests, given that another characteristic of the 19th century is the commercialization of art. “My feeling is that he would say his work has value,” Dialla answered, although she added the imperial family only purchased work by Vereshchagin that lacked a political message.